Global Mobility Solutions (GMS) is proud to be recognized by HRO Today as a top relocation company for the fourth year in a row. Every year, HRO Today compiles customer surveys and other data to produce their Baker’s Dozen list of the best relocation companies. HRO Today’s Baker’s Dozen rankings are based solely on feedback from buyers of the rated services; the ratings are not based on the opinion of the HRO Today staff. Feedback is collected annually through an online survey, which is distributed both directly to buyers through HRO Today’s own mailing lists and indirectly by sending service providers the link to send to their clients. Overall ranking is determined by analyzing the results across three subcategories: features breadth, deal sizes, and quality. Using a predetermined algorithm that weighs questions and categories based on importance, HRO Today calculates scores in all three subcategories as well as an overall score. The rankings are based on those scores. The fact that our customers continually place GMS into the Baker’s Dozen list of top relocation companies speaks volumes with regard to our outstanding service, our breadth of programs, and the value that we bring to our clients. 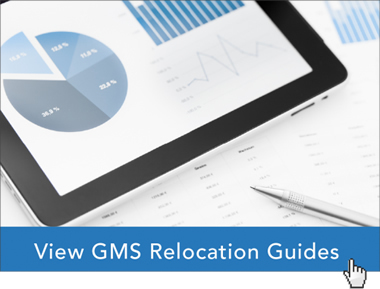 To see how GMS can make your life with regard to workforce mobility easier, simply ask for a complimentary relocation policy review and our expert consultants will discuss how to improve acceptance rates, make assignments more successful, and make the whole process more cost-efficient. Get your complimentary Relocation Policy Review today!